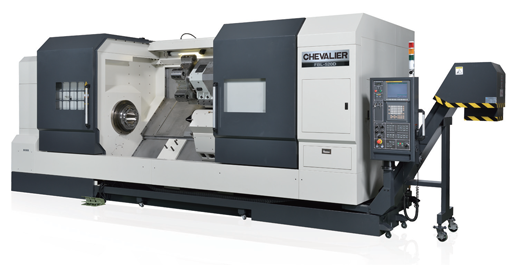 Chevalier’s FBL-520D heavy-duty horizontal turning lathe, perfect for machining heavy parts and large pipe threading, is in demand by the energy and aerospace industries. The series features highly accurate machining that can handle rough- and fine-turning operations. The gear box provides enough horsepower for heavy-duty turning. With live tooling capability, this series can save time by milling and turning a part in the same set-up. The series structure features a 45-degree slant-bed design, comprised of single-piece Meehanite® cast iron with a wide-span, ribbed box structure. For stability and support, the machine provides box guide ways that are 5.1″ wide by 3.1″ thick. A powerful 60HP spindle motor, which features a two-stage gearbox and generates 9,000NM of torque, satisfies most cutting conditions of large-diameter work pieces or tough material applications. The 12-station turret is 200mm thick for deep hole boring and rough turning. The 15″ through hole is perfect for pipe yard threading and meets API thread standards. STRUCTURE: Heat-treated to Rockwell 55-degree and stress relieved. Features a 45-degree slant-bed design, comprised of single-piece Meehanite cast iron with wide-span, ribbed box structure. Four oversized box ways, 5.1″ wide and 3.1″ high, provide strong stability and support. 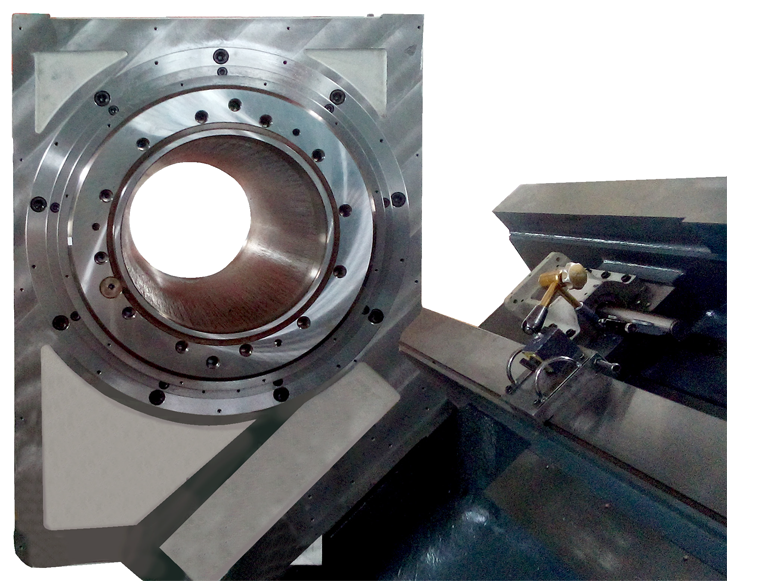 CAPACITY: Spindle bore diameter is 15″ and a maximum swing diameter is 40″; cutting diameter is 37″. Dual-chuck, easy-access design provides convenient loading and unloading of longer parts. POWER: Powerful 60 HP spindle motor features a two-stage gear headstock and generates 9,000NM torque, satisfying most cutting conditions of large-diameter work pieces or tough material applications. TURRET: Massive, 7.8″ (200mm) thick disk and hydraulic clamping of its curvic-coupling design ensure cutting stability during rough-turning environments. ACCESSORIES: Standard programmable tailstock has a built-in MT-6 rotary quill that provides better parts weight support than a normal live-center type of quill. Standard link-type chip conveyor is also a standard accessory. Optional BMT85 power tool turret is available for milling the part with one set-up. The FBL-520D features a 15″ through hole, easy access and features a single-piece casting.